Let’s cover the last few essential pieces of Yahoo Gemini. 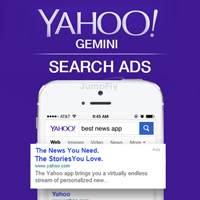 Yahoo Gemini uses Dot for event tracking across Yahoo’s search and native ads. Advertisers who use Dot can also gain access to additional insights in the performance of their campaigns and adopt remarketing. In the Gemini UI, you’ll receive your Dot code when you create your first conversion rule. The Dot code goes on every single page of your website in the <head></head> section. Conversion rules can either use a destination URL (begins with, equals or regular expression) or you can create an event. If you use the destination URL option, there is no other code you have to install. Simply install the main Dot code and create your conversion rule in the Gemini UI. However, if you want to use an event, you will have to install one additional snippet of code. You can now report conversion revenue with event codes, as well. Install this code only on the conversion page or trigger in the <body></body> section. One of the interesting features of Dot is its ability to integrate with Bing Ads UET. You can link these two tags if you contact your Yahoo account manager and take advantage of Dot’s full functionality, which includes the ability to track performance on the Yahoo Bing Network. The Yahoo Gemini reporting dashboard has a variety of pre-built and custom reporting options for you to get pretty much any data you need. You can schedule the reports to run Once, Daily or Weekly. At this point all reports are exported as CSV files, so if you’re looking for fancy graphs and bells and whistles, you’ll have to wait awhile. That being said, you can still get the data you need in order to make optimizations. As someone who’s been using Yahoo Gemini for awhile, I will freely admit that campaign optimizations can be difficult. The UI needs a lot of work and we encounter tons of glitches. While you can now view data down to the keyword level within the UI, sometimes you can’t see the keyword or change bids like it’s designed to do. These are the growing pains I eluded to earlier, and unfortunately it’s just part of the deal. We’ve found the best way to manage these campaigns is to export your data into excel and upload any bid changes as a bulk upload. While this is not ideal, it is reliable. My Audience – Website Actions, Mobile Device IDs, Emails and In-App Events. Yahoo Gemini definitely offers some unique opportunities. For those of you struggling for traffic or if you know that your target audience is using Yahoo, it’s probably time to test this new network. Get in touch with your JumpFly Account Manager and we’ll help get you started! 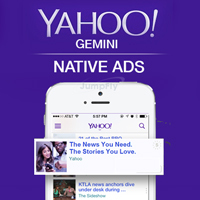 Last week I covered Yahoo Gemini Native ads. This week is all about Yahoo Gemini Search Ads. While Yahoo can deliver search ads for up to 49% of desktop traffic, Gemini has done most of their enhancements on the mobile search experience. They’ve made a richer and more helpful ad to enable the consumer to take action quickly. The new Yahoo Mobile search enables action by showcasing the best results from top sources across the web and industry leading partners. It also drives engagement through a new look and feel built around people, places and things, and the way you use your phone on the go. This new experience has been successful for them with sessions increasing by 80%. You can create search campaigns in the Gemini user interface, but if you are a power user like us, you are probably asking yourself: “Where’s the editor?” There isn’t one…yet. Your best bet on building search campaigns in Gemini is to create limited ad groups with only your top performing keywords. Alternatively, your Yahoo account manager can import your Google or Bing campaigns. Keywords: Target with broad, modified broad match, phrase and exact match keywords. Negatives are exact or phrase match. Keywords can have their own destination URL. Ad Specifications: The big benefit of Yahoo search text ads are the generous 50 character titles. The other character limits are pretty standard with 150 for the description and 35 for the display URL. Ad rotation is automatically set to optimized. Ads support the use of dynamic text. Geographic Areas – Like Native Ads, you can target by country, state, city, DMA and radius around coordinates. Radius can be specified in increments of 1 mile up to 500 miles specified by longitude and latitude. Geo Bid Adjustments are available from -90% to +900%. Bid adjustments can only be made through bulk upload or via the API. Time Of Day – Ad scheduling is possible in 15 minute increments. Scheduling can only be done through bulk upload or via the API. Device – Bid modifiers are available for all three devices. Desktop from 0-100%. Smartphone from -100% to +300%. Tablet from -20% to +300%. Bid adjustments can only be made through bulk upload or via the API. Sitelink Extensions – While these are not enhanced with description lines, you should definitely include them. They can only be added through bulk upload or via the API. Call Extensions – These do not use a forwarding number for tracking and can only be added through bulk upload or via the API. Product Ads: This is currently an open pilot and is only available on smartphones and tablets. Desktop testing is underway, but it is not yet open to advertisers. These must be set up through your Yahoo account manager. I’ll talk about my final thoughts on Yahoo! Gemini next week. Last week we covered the three types of Yahoo Gemini campaigns. This week is all about Yahoo Native Ads. Yahoo Native Advertising is available on mobile, tablet and desktop computers. Essentially, it’s when the ad experience follows the natural form and function of the user experience in which it is placed. On the Yahoo Network, this could mean appearing seamlessly between other articles on Yahoo News, in the stream on Yahoo Homepage, on Tumblr, Flickr and more. Basic ad scheduling is available in the form of start and end dates. Native ads include a generous headline (50 characters), ad description (150 characters), your company name (25 characters) and a static image (1200×627 and 627×627) or video (MP4, 4:3 or 16:9, Up to 1GB). Videos have autoplay and expanded view. A view counts when 50% of pixels are in view for a minimum of 3 seconds. Audio is turned off by default and like static images, they are clickable to the advertiser’s site. Given the nature of native ads, Yahoo recommends changing your creative every 5-7 days. Images should be simple, feature a single product, include a logo and should not contain more than 20% text. Ad copy should tie in with the product image and aim to drive an emotional response. Native ad targeting options are really the star of this platform. From default broad targeting to niche lower funnel targeting, Gemini has you covered. Yahoo recommends using a blend of targeting aligned within one creative strategy for best results. This allows you to change your messaging as a user moves further down the sales funnel and deliver the biggest impact at the right time. Language, Geographic & Demographic Targeting : Standard language and gender targeting is available. Gemini also allows you to include or exclude by country, state, city, DMA and radius. Radius can be specified in increments of 1 mile up to 500 miles specified by longitude and latitude. Age brackets include 18-24, 25-34, 35-44, 45-54, 55-64 and 65+. Broad Targeting & Behavioral Interest Targeting: Unlike most other ad platforms, if you set no targeting criteria whatsoever, it doesn’t just show your ad to anyone and everyone. Yahoo calls this broad targeting and uses Gemini’s personalization engine to target your ads. It looks at your website, user search history, user behavior and more to find your relevant audience. Interest targeting allows you to choose general categories if you want to give their engine a bit more direction, but either way, this is their most basic level of targeting. Search Retargeting: This targeting method allows you to serve native ads to users who have searched for terms from your pre-defined keyword list. This can be very useful in getting your business in front of potential customers when they are further along in the sales cycle. Site Retargeting: Get even more precise with retargeting and serve tailored native ads to users who have visited your site in the past. It works within a max 30-day window. Mail Domain Retargeting: This targeting option is Yahoo’s version of Gmail Sponsored Promotions. It allows you to serve native ads to Yahoo Mail users who have received emails from your pre-defined list of domains. Customer List: Although email targeting is not (yet) available, you can target a customer list of Google or Apple Advertising ID’s. Email lists are in the works. Custom Bundles: If you have a specific profile of your ideal customer, get in touch with your Yahoo account manager. They can create custom bundled audiences based in your feedback. 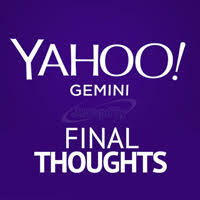 Check out my blog next week on Yahoo Gemini Search Ads.